Iodine Global Network (IGN) - 11. Who can prevent IDD? What parent doesn't want their new son or daughter to have every opportunity for success and happiness in life? What citizen can ignore an easily-corrected condition that consigns some innocent newborns to suboptimal brain development. 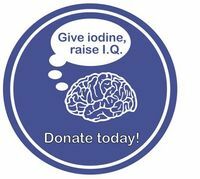 Iodine deficiency depresses IQ by 10-15 points. A nation with serious iodine deficiency saps its economic potential even as it perpetuates disregard for the health and development of its human assets. Some problems are so large and complicated as to defy ready solution. Iodine deficiency is just the opposite. Its impacts can be readily discovered and the solution – iodized salt in most cases – is inexpensive and thoroughly proven. Substituting iodized salt for plain salt in family meals and on the table is simplicity itself. Insisting on iodized salt in school meals is worth parents' registering their views with school officials. Testing salt in the home with simple kits that will show whether the salt has been iodized should be common practice where there is any doubt about salt quality. Yes, parents and citizens, your involvement can make a difference! Public health agencies in Switzerland and the United States realized 80 years ago the enormous benefits available by fortifying salt with iodine. Health agencies must provide the sustaining leadership to create and maintain long-term solutions to problems of iodine deficiency. In 1990 the United Nations' World Summit for Children identified iodizing salt as a Millennium Goal, recognizing that many countries had not yet put effective programs in place. If you are an official in a country that has a strong program, perhaps your personal or agency expertise could be enlisted as technical support for another nation grappling with its challenge. In the U.S., for example, the Centers for Disease Control and Prevention (CDC) is a solid partner in the Iodine Global Network. If you are an official in a country struggling to put an effective program in place, please know that many stand ready to support your efforts. Contact your Iodine Global Network Regional Coordinator or your UNICEF country office. Identify stakeholders who can be organized into a national coalition to explore the challenge and fashion a unique solution for unique challenge. Don't wait. Get started today. When it comes to iodized salt, this preferred solution to overcoming iodine deficiencies naturally centers on the engagement and commitment of those who have the salt, starting with salt companies. The salt industry has been in the forefront of national efforts to combat iodine deficiency for 80 years. Salt industry trade associations often serve as the locus of industry involvement and as key stakeholders in national coalitions to promote iodized salt. If you are a salt producer in a country which has achieved iodine sufficiency, you may want your salt producers association to join in the global campaign against IDD. Often salt producers can provide consulting expertise in other countries, coordinated through the Iodine Global Network, supplying insights on market impediments or salt-making technology that can help salt companies become part of the solution. If you are a salt producer in a country that has yet to establish a sustainable program, contact your Iodine Global Network Regional Coordinator, your UNICEF country office or one of the large salt producer associations, such as the Salt Institute. Discuss with your salt producers trade association the opportunity for the salt industry to join in the solution to this vexing problem. Volunteer to be part of a stakeholders coalition with others who want to move ahead. You don't need to be a thyroid doctor or endocrinologist to understand the importance of improved iodine nutrition – and the relative ease and cost-effectiveness compared to dealing with the social impacts of IDD. Medical professionals have a special opportunity to provide leadership since their neighbors and communities respect their judgment in such matters of their training and expertise. Medical professionals are also generally well-networked in their communities, able to educate and mobilize broad segments of their neighbors. And medical professionals are tied into public health agencies without which no national coalition can hope to succeed. So, if you're a medical professional, your role might be to encourage your local public health leadership to prioritize improved iodine nutrition using the tools on our website. Many international development agencies are already deeply committed to improving iodine nutrition. UNICEF, the World Health Organization, Kiwanis International, U.S. Centers for Disease Control and Prevention, the Micronutrient Initiative, the Global Alliance for Improved Nutrition (GAIN), the Salt Institute, EuSalt and the China National Salt Association and many, many more are involved at the global level. Their country offices and local chapters and members are excellent candidates to participate in national coalitions; they can get support from their parent groups. The key is in-community advocates. Even the best-informed international experts in Geneva, New York, Atlanta or Ottawa are no substitute for a respected neighbor and community leader in terms of explaining the value of salt iodization locally. If you work for a local office of any development agency, get involved. Boy Scouts, teachers unions, women's groups – these and all manner of community organizations find valued roles in national coalitions to promote universal salt iodization. Get involved. Establishing sustainable salt iodization programs requires public understanding and support. Since children and the unborn are those most at risk, it makes sense that school teachers assume an active leadership role in creating community awareness, mobilizing support and teaching their students the imperative of using iodized salt. Simple test kits are readily available and many teachers simply ask their students to bring a small portion of salt from their table or kitchen at home and use their class time to test the salt and teach the children how to do the tests. Creative teachers do even more!